Information and Communication Technology (ICT) plays an increasingly greater role in the development of nations. It has become an indispensable tool for achieving international goals such as the United Nations Millennium Development Goals (MDGs). However, the poor connectivity of Internet in the least developed countries is one of the major factors underlying the digital divide between the developed and developing nations. This situation becomes worse if the country is landlocked as well as being underdeveloped. This paper tries to bring out the realities of ICT usage in Bhutan, being a landlocked country that is the least developed in southwest Asia. Keywords: Bhutan; ICT; Internet; development;school education; tertiary education; networks. Bhutan is a small and beautiful country sandwiched between India and China. It has formidable geographical barriers. These geographical barriers have enabled the country to maintain its cultural uniqueness. The country is not only landlocked, but also has one of the most rugged mountainous terrains in the world, with elevations ranging from 100 meters to 7,500 meters in height. Furthermore, about 70% of the land area is covered by dense forests. The steep, unstable terrains and disseminated population of the country make development policies very fragile and expensive. Bhutan's population as per the 2005 census is 672,424, out of which 90% of the total population live in rural areas. This rural majority is deprived of ICT usage compared to the urban minority. ICT is changing the way the world works and will continue to do so in future. The question of interest here is: Will the rural communities in Bhutan have sufficient access to ICT so as to take full advantage of this technology to uplift their living standard? Being landlocked and a least developed country, the most prominent challenge faced by Bhutan is access to the world market. International connectivity by land is possible only through India using four exit and entry points. Transport connectivity and transit to Bangladesh and Nepal are also possible through India only. Bhutan uses the seaports of Kolkata and Haldia as the main maritime gateways for International trade to countries other than Bangladesh and Nepal [A special report, MoIC, 2007]. India is Bhutan’s main trading partner, although other neighboring countries like Bangladesh, Nepal and Thailand are also involved in trade to varying degrees. Another important challenge faced by Bhutan is its limited domestic resources available for investment in public goods and governance. This is more closely linked to the fact that Bhutan is a least developed country rather than it being landlocked. Bhutan launched its first telecommunication (analog) network in 1963 connecting a few major parts of the country. In 1989, all parts of the country were linked by a modern telecommunication network. It was only in 1998 that a fully digital national telecommunication network was established connecting all Dzongkhags (districts) and major towns in the country [A special report, MoIC, 2007]. Information technology (IT) has been recognized by the Royal Government of Bhutan as an unmatched developmental tool as well as an area of new business and employment opportunities for all the Bhutanese people. Although computers were introduced in the country in the early 1980s, and these computers and computing applications have been used since then, the real emphasis on IT first gained momentum when the country experienced television and Internet in 1999. Though a late starter, there are supportive government policies, programs and plans to bring Bhutan to the forefront of technology. In line with the MDGs, Bhutan initiated an IT curriculum in schools and started train-the-trainers (TOT) programs for school teachers such as ‘Postgraduate Certificate in Teaching of Information System’ to teach IT curriculum in schools starting from 2000. Bhutan also introduced an IT curriculum to its teacher education program at the Paro College of Education (PCE) under the Royal University of Bhutan (RUB). Recently, the Department of Information and Technology under the Ministry of Information and Communication (MoIC) set up a Local Area Network in each and every Dzongkhag called the Dzongkhag Local Area Network. Bhutan’s capital city, Thimphu also has a Wide Area Network- alternatively called the Government Intranet, a broadband optical fiber network. This Intranet links all the government agencies, corporations and autonomous agencies in the capital city [A special report, MoIC, 2007, p28-p29]. At present, all these organizations are equipped with basic IT facilities like desktop computers and printers. However, ICT is still a relatively recent phenomenon in Bhutan, where it suffered initially from a general lack of leadership. No real vision for how ICT could be integrated in the overall development strategy of country was articulated until Bhutan Information and Communication Technologies Policy Strategies (BIPS) was developed in 2004. An ICT unit was established in each district so that ICT activities could be decentralized across the country. The Department of Information Technology coordinates and guides the districts’ ICT units. Based on the BIPS document, a number of committees were formed by the Royal Government to promote the use of ICT as a developmental tool for the nation. These committees are: Policy Committee, Infrastructure committee, Human Capacity Committee, Content and Application Committee and Enterprise Committee. The membership of these committees consists of all ICT unit Heads from across Government, including the Ministry of Information and Communication, Policy and Planning Division (PPD) and the Director of the Department of Information Technology. These committees are responsible for monitoring and implementing the policies and strategies outlined in BIPS [BIPS, July 2004]. to create a “High-Tech Habitat”. “ With people at the center for development, Bhutan will harness the benefits of ICT, both as an enabler and as an industry, to realize the Millennium Development Goals and towards enhancing Gross national happiness” [ICT White Paper, DIT 2003]. Based on the above vision, the Royal Government of Bhutan is committed to work towards developing ICT infrastructure, human resources, polices, enterprise, content and applications. “The enormous opportunities that exists in the IT and related field should be encouraged and promoted. The priority should be to prepare the IT strategy and activate it. The private entrepreneurs, institutions, schools and other interested individuals should be encouraged to participate in the promotion of this important technology” [Bhutan 2020, 1999, p.63]. Bhutan first experienced the Internet in 1999. Until the end of 2003, there was only one Internet Service Provider, Druknet, a sister company of Bhutan Telecom Limited, the main, government-sponsored telecommunications provider in the country. Bhutan Information Communication and Media Authority (BICMA) has to date issued licenses to six additional private enterprises to provide Internet services. However, only two out of six ISPs are in the market at present. These two ISPs are providing only wireless broadband internet services using Very Small Aperture Terminal (VSAT). Out of the three functioning ISPs, only Druknet provides services to all regions in the country, while the rest only provide service to limited regions at present. As of 2007, there were 6000 dial-up users and 90 organizations having leased-line Internet connectivity according to Druknet. The estimated number of Internet users in Bhutan has grown from only 500 users in 2000 to 30,000 in 2007. Compared to some of the countries in Asia, Bhutan has shown higher per capita growth in terms of Internet user penetration in the country [Table 2]. The people have limited understanding of what ICT can do in developing the nation. However, there are signs of improvement in the awareness of ICT among the educated lot through the Government initiatives. However, there is still the need to make people understand the role of ICT in development. As an example, at Sherubtse College, in 2001 there were only 20 computers in total. Moreover, these were mainly for the courses that required computer access. Only one of the faculty members (Head of the Department of Computer Science) had a computer with dial-up Internet access. Currently, this same institute has more than 250 computers all connected with leased-line Internet, and one of the computer laboratories is open to all the students without differentiating the disciplines. Despite this progress, there are still a handful of students who do not make use of this laboratory and take advantage of the IT facilities. The sector faces an acute shortage of skilled ICT manpower in the country. At present there are few institutes that offer degree courses in the field of ICT. Sherubtse College is the main institute under the RUB that offers a Bachelor of Science degree in Computer Science (B.Sc. in CS). So far only 94 students have graduated with a B.Sc. in CS or other ICT related fields since 1999 from this institute. The Royal Institute of Management also offers Diploma and Certificates courses. Furthermore, there are only a few private institutes which offer Certificate and Diploma courses related to ICT. All of these institutes are facing a shortage of national faculty members in the Sciences, especially in the field of Computer Science. Indeed, about 70% of the faculty members in the Department of Computer Science in Sherubtse College are contracted from India. As far as the training of future ICT professionals and educators is concerned, at the most approximately 30 to 40 students would be graduating with a bachelor’s degree in the field of ICT each year. Given the capital-intensive nature of ICT investment, Bhutan currently lacks adequate financial infrastructure to encourage private sector participation. There are 44 private IT firms [A special report, MoIC, 2007, p.6]. Out of these, about 90% of the firms are simply hardware vendors. Additionally, there are about 19 private training institutes in operation offering Certificates and Diploma courses in IT. However, these institutes lack the capital and human resources to provide quality training and offer advanced-level courses. Moreover, all of these institutes are located in urban areas only, thereby making it difficult for students living in remote regions of the country to access these facilities. There is currently no policy at the institute level or government level to facilitate research and development in the field of ICT. Nowhere in the BIPS document is there any mention of research in the field of ICT [BIPS, 2004]. Due to the lack of ICT-related research in the country, there are problems in the implementation of ICT projects. Thus, there is a need to carry out research in the field of ICT to facilitate development of generic and industry related solutions. Since the country has only modest financial resources, there has not been much investment made to ICT until recently, even though the government’s stated goal is to bring the country to the forefront of technology. The Director, Department of Information Technology (Kuensel, 26 April 2008) said, “The total budget to develop ICT during the ninth five year plan was almost 80 million, which is actually the cost of building one higher secondary school with boarding facilities”. Even given the modest budget, poor allocation of funds is an additional problem, one caused largely by a lack of commitment from the leaders in the ICT sector. Use of Internet Technology remains limited among the general public due to several factors: (1) Most cannot afford to own personal computers; (2) there are not many public Internet access centers for those without personal computers; (3) the high price of network connectivity is a barrier to widespread public Internet usage. The cost of computers and Internet charges are relatively high [Table 2 and 3] as compared to the earnings of the people in the country. The salary as per 2006 records for a minister is Nu. 39,500 per month [Bhutan Portal, 14 May 2008], whereas the daily wage for laborers is Nu. 100 per day (~Nu. 3,000 per month). For public access, there are about 35 Internet Cafe license holders but only 19 are currently operational [MoIC, Special Report, 2007]. These cafes are mostly concentrated in the urban areas thereby leading to a digital divide in the country between the urban and rural populations. Although the medium of instruction in schools in Bhutan is English, there are still many monastic institutions both private and public where the instruction of medium and the textbooks are in the National Language, Dzongkha. Besides these institutes, there are many local people who can read and write only in Dzongkha. However, Bhutan does not have any internet sites which are published in Dzongkha. Thus, the Internet users in Bhutan fully depend on English to publish or to read online information. As ICT is relatively new to the Bhutanese people, not much about Bhutan and its history is fully digitized. There are not many sources of information regarding Bhutan on the world-wide web. In some cases, even the available online information is found to be riddled with inaccuracies. To make ICT facilities affordable to each and every citizen, the price for an Internet connection should be reasonable. However, the price for Internet connections in Bhutan is excessively high due to several factors. Until recently, there was a monopoly in providing Internet Services - Druknet was the only ISP in the country up to 2005. Although Bhutan has now about seven Internet Service Providers, most are limited to specific regions of the country. Only Druknet provides services to all parts of the country, so it still has an effective monopoly over Internet connectivity in Bhutan. Apart from the leased-line services provided by the Druknet, it also provides dial-up Internet access or DSL/broadband connections (from 2008). Druknet’s monthly tariff for Leased-Line [Table 3] and Broadband [Table 4] Internet connections are given below. The dial-up connection is free of cost, though local telephone charges still apply. In addition to the high price of an Internet connection from the service providers, the costs for operation and maintenance are also high. This is to due to poor ICT management and the lack of skilled human resources in the country. Reliability in the internet connection itself is also lacking. This is mostly due to the unreliable power supply in the country. Although considered rich in hydroelectric power, Bhutan does not have reliable electricity, especially in the eastern region of the country. As of 2007, there are 502 schools which include Community Primary through Higher Secondary schools, as well as ten Tertiary Institutes and six vocational training institutes. Currently, there is incomplete information available regarding the level of ICT education included in the general curricula at the High School level. However, there is a constant effort from the government to create ICT awareness among the schools in the rural areas. “Hundred community primary schools were provided with two computers and a printer each, with free Internet facilities for a year where feasible. One teacher in each of these schools was trained in basic computing skills….” [A special report, MoIC, 2007]. ICT literacy curriculum currently being developed will be implemented. The trained Information Technology (IT) focal teachers will be posted in all secondary schools in the 10th plan. General teachers will also be trained in the use of IT through cluster based and school based workshop and seminars to be resourced by IT lead teachers with certification at the end of training. The use of CDs and e-learning materials shall be piloted for a range of subjects during the 10th five year plan period. An in-house multimedia team will be formed at the Curriculum and Professional Support Division (CAPSD) under the Ministry to work in close collaboration with various subject experts in order to develop context-relevant and need-based CD titles. To reap the benefits of ICT as an “enabling” tool, basic minimum infrastructure such as computers, LCD projectors, software and Internet connectivity must be in place. All higher secondary schools and middle secondary schools will be provided with a total of 35 computers, and lower secondary schools and primary schools will receive five to ten computers. Based on the school population, the long term target is to meet a computer-student ratio of 1:10 in higher and middle secondary schools by 2012, and 1:20 in lower secondary and primary schools by 2020. To appoint a computer lab technician in all higher secondary schools and middle secondary schools during the 10th five year plan. All tertiary institutes under the RUB have access to the Internet. The RUB gives much importance to ICT in its curricula. All the institutes under the RUB have a module on ICT irrespective of the disciplines. There is a plan to establish a University Wide Area Network which will connect all institutes under RUB by the end of 2008. This will facilitate information sharing among the member institutes. Although the tertiary institutes do benefit from ICT as they have Internet access, there are still difficulties in having an adequate number of computers in comparison to the total strength of the users in the institutes. As ICT has become an indispensable tool for development, there is hardly any country in the world that has not embraced ICT as one method to enhance prosperity and happiness. Bhutan has developed mechanisms and policies to develop ICT’s capabilities and to harness its power to accelerate social and economic growth in the country. However, inherent structural problems and inadequate technological and financial capabilities can restrain a country’s capability to develop and diffuse ICT for development. Most of the policies and guidelines on ICT in underdeveloped countries are modeled on examples from developed countries without proper consideration for the country-specific challenges. Consequently, the underdeveloped countries may fail to take full advantage of the benefits from their ICT infrastructure and capability. Therefore, each developing country needs a better understanding of its specific needs to ensure that it derives maximum benefit out of ICT. The following are the key factors which the authors feel important for promoting ICT, among many others. At present almost all ICT consultancy work is done by foreign expatriates. In the process there is less opportunity for the Bhutanese people to develop their skills. It would be beneficial to the government if ICT consulting work is done as collaboration between Bhutanese nationals and foreign experts. It is very important for all schools to be introduced to ICT related curriculum. The acquisition of ICT literacy and skill in the country will depend on how much ICT related curriculum is introduced in primary and secondary schools as well as in tertiary education. ICT should also be properly applied as a tool to improve basic as well as advanced education. At present there is very minimal research done in the field of ICT in the country. To promote ICT, research and development should be linked with the universities and other centers for research. A major goal of this research should be in providing direction to the country for properly implementing ICT infrastructure development given its specific needs and challenges. ICT infrastructure should be in place throughout the country. This should be affordable to the general public in terms of cost, and all communities should have access to ICT. The price for Internet connections should be held at a reasonable level, to be negotiated by the government with the ISPs in the country. Few websites can be seen which are published in the national language, Dzongkha. Additionally, the content on the World Wide Web is very poor regarding Bhutan. Therefore, the government should initiate projects on how the country can digitalize and publish its information and history on the web. This will further encourage people to use ICT for learning and research purposes. It would be useful for those living outside the urban centers if the Government could provide Public Internet Access Centers in rural Dzongkhags. Each Dzongkhag has its own Local Area Network at present. But there is no connection with the other Dzongkhags. A Dzongkhag Wide Area Network can be useful for sharing information among Dzongkhags as well as with a central headquarters. The government also needs to promote the application of ICT by introducing e-government, e-health, e-business and e-tourism. 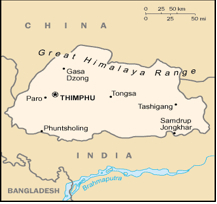 The majority of the Bhutanese population lives in rural areas. Therefore, it is important to promote access to ICT services throughout the country, especially in schools in the rural areas. Internet is mainly focused as a tool of ICT in this paper, internet user is defined here as anyone having access to an internet connection point, and has the basic knowledge for internet usage. Bui, T.X., sankaran, S. and Sebastian, I.M. 2003. “A framework for measuring national e-readiness.” International Journal of Electronic Business vol. 1, pp 3-22. Ministry of Information and Communication, 2003. “Information and Communications Technology (ICT) Policy for Bhutan.” A White Paper. Tshering, K. 2007. “Country Report (Bhutan)” Capacity Building Workshop on Information Society Statistics: Infrastructure and Household Indicators.